Approximately 3-4 weeks. If you are working with a tight deadline, let us know ASAP and we’ll do our best to meet your deadline. What diameters can I get metal drapery hardware in? What diameters can I get wood drapery hardware in? Any finish you like! You can select from any manufacturers paint or stain color, or provide us with something to match (for example, a piece of fabric, a photo of something, an item), or just describe the finish and we’ll send you a strike-off for approval. What diameter can I get a Traversing Metal Rod in? What diameter can I get a Traversing Wood Rod in? What diameter can I get Traversing Wood Rods with Motorization? If I am doing motorized traversing rods, what do I send to you? How do I get an Estimate? Does it cost anything? Send an email to Jayne@WindowImagination.com or call us at (978)655-4394, provide us with the details of what you are looking for and we’ll email you a Free Estimate. Why does it take a little longer to get an Estimate for Custom Brass or Stainless Steel? We manufacture wood and wrought-iron in-house, so we are able to provide pricing immediately. We work with a custom fabricator for brass and stainless steel, so we must contact them to get pricing. As soon as we have pricing, we are able to send you an Estimate. Can you curve wood rods? Can you curve metal rods? Can you make drapery rods for mitered bays? Yes – in both wood and metal. Do you offer French Returns? What is special about Standard Traversing Wood Rods from Window Imagination? The tracks are inserted into a channel cut into the BACK of the rods (as opposed to the bottom of the rod), making the tracks virtually disappear. The track is completely hidden behind the rod. What types of metal drapery hardware do you carry? Our “Standard Line” comes in: Polished Brass, Satin Brass, Polished Chrome, Brushed Nickel, Black Nickel and Ancient Bronze. Available in 1” and 1 3/8” Diameters only. What else should I know about your Metal Drapery Hardware? We offer an array of metal hardware. For truly custom metals (wrought-iron, brass and stainless steel), you can choose from 7 different diameters, several different finishes, which can be made with finials or soft rounded elbows or sharp 90 degree mitered elbows, in custom projections and with custom brackets and flanges. 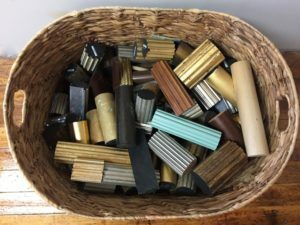 For a more price sensitive option we have a Standard Line of Metals in 1” and 1 3/8” diameters in Polished Chrome, Brushed Nickel, Polished and Brushed Brass, Black Nickel and Ancient Bronze. If I need to talk through my project to determine the best solution, is there someone I can talk to? Yes! Send us an email at Jayne@windowimagination.com or call us at (978)655-4394. We are happy to help! How do my orders get delivered? If you order is under 96” in length, we use UPS. If it is over that length, we can send it via courier, or via a Freight Carrier (for longer distances). How long does it take for me to get my order once it has shipped. UPS is normally one-day delivery. A courier service can deliver same-day. If you are across the country from us, it can take up to a week to arrive via UPS. Yes and no. If the amount is $500 or more we can process your payment via credit card. If the amount is under $500, please mail us a check made out to Window Imagination, Inc. When I am ordering a Rod with an Elbow Return, what length do I give you? Please tell us the length of the rod from OUTSIDE the elbow to the OUTSIDE of the other elbow. If I am not a member of the trade, how can I get your hardware? Can I buy tracks only from you? Can you custom paint/finish them? Do you carry heavy-duty tracks for heavy draperies? Yes. We use KS Ball-Bearing Tracks for heavy-duty applications. When requesting your Estimate, please let us know if your project will involve heavy draperies. How can I get my rings to slide more smoothly over my rod? Spray the rods with silicone spray. What measurements do you need for bay windows? When requesting an Estimate, what type of information does Window Imagination need from me? Specific lengths of rods needed (we assume this is your drapery face-width, which would not include the length of the finials – unless you specify that it includes the finials.) For rods with Elbows, provide length from outside elbow to outside elbow. If doing motorized traversing rods, tell us which side you want to mount the motor. Any special information you’d like to share about your project. How do I make my Estimate into an Order? Yes! (within a certain radius of our office) Call us at (978) 655-4394 to discuss the details of your project and we will provide you with a quote. Do you provide measuring and templating services?